Impatiens necrotic spot orthotospovirus (INSV) can impact economically important ornamental plants and vegetables worldwide. Characterization studies on INSV are limited. For most INSV isolates, there are no complete genome sequences available. This lack of genomic information has a negative impact on the understanding of the INSV genetic diversity and evolution. Here we report the first complete nucleotide sequence of a US INSV isolate. INSV-UP01 was isolated from an impatiens in Pennsylvania, US. RT-PCR was used to clone its full-length genome and Vector NTI to assemble overlapping sequences. Phylogenetic trees were constructed by using MEGA7 software to show the phylogenetic relationships with other available INSV sequences worldwide. This US isolate has genome and biological features classical of INSV species and clusters in the Western Hemisphere clade, but its origin appears to be recent. Furthermore, INSV-UP01 might have been involved in a recombination event with an Italian isolate belonging to the Asian clade. Our analyses support that INSV isolates infect a broad plant-host range they group by geographic origin and not by host, and are subjected to frequent recombination events. These results justify the need to generate and analyze complete genome sequences of orthotospoviruses in general and INSV in particular. Orthotospoviruses cause high economic losses worldwide [1, 2]. Most of the information about orthotospoviruses was acquired by studying the type species Tomato spotted wilt orthotospovirus (TSWV) [3–16] and their molecular features are shared among members of the genus. Orthotospoviruses are transmitted by thrips (order: Thysanoptera, family: Thripidae) in a circulative and propagative manner [17–20]. Four species belonging to the genus Frankliniella are INSV vectors . Orthotospoviruses are classified based on nucleocapsid (N) amino-acid (aa) sequence identity and serological cross reactivity, plant host range and thrips transmission specificity , and are considered as distinct species when their nucleocapsid aa identity is less than 90% . INSV was first designated as TSWV-I strain [24, 25, 26, 27]. INSV glycoproteins are serologically related to TSWV, while the N proteins are serologically unrelated [24, 28]. INSV’s host range includes about 300 plant species . Even though INSV can considerably affect vegetables, its economic importance for vegetables was less than for ornamental plants [29, 30], but in the last few years [21, 31]. INSV importance is increasing in vegetables in Europe and North America. Characterization studies on INSV are quite limited. Until now, only four complete INSV genomes have been sequenced. The type isolate (NL-07) was reported by van Poelwijk et al. in 1997 and consists of an L and S segments from the Netherlands [32, 33], and an M segment from the US  (M74904.1; NC_003625.1, NC_003616.1, NC_003624.1). The M segment from the US was included in the type isolate because it differed by only 4 nucleotides from the M segment of NL-07, whose 700 (out of 5000) nucleotides were sequenced at that time, even though the similarity between the remaining 4300 nucleotides was unknown. Among the three remaining INSV full genome sequences, one is from Italy (DQ425094.1, DQ425095.1, DQ425096.1) and two from China (GQ336989.1, GQ336990.1, GQ336991.1; GU112503.1, GU112504.1, GU112505.1). Isolate GU112505.1 from China contains a non-functional RdRp due to mutation and is missing a portion of the S segment, lowering the number of complete INSV sequences de facto to two. Availability of genomic sequences from different geographic origin is pivotal to understand INSV genetic diversity and evolution, especially considering that orthotospoviruses have a tripartite genome and can reassort. Furthermore, while for other orthotospoviruses like TSWV, the aa sequence of N is sufficiently diverse to confer phylogenetic character, the INSV-N is highly conserved and it is not phylogenetically informative [35–37]. Genetic analysis can be used to characterize the structure of a virus population in relation to a location or host, and to probe the origin in a population and gene flow across time and space. Thus, we suggest that it is important to fully sequence a larger number of INSV genomes, and information gained by doing so will generate understanding of the etiology and aid management of the disease. INSV isolate UP01 was found in a commercial greenhouse in Pennsylvania in July 2014, in an impatiens showing ringspots symptom, acquired complying with Penn State institutional guidelines. The plant was initially tested for TSWV, INSV, Tobacco mosaic virus (TMV), and Cucumber mosaic virus (CMV) by ImmunoStrip® assays (Agdia, Elkhart, IN, USA), and found to be infected only with INSV. Following four passages by mechanical inoculation from single lesions on Nicotiana benthamiana, the virus species was confirmed by ELISA assay (Agdia, Elkhart, IN, USA). Mechanical inoculations were used to assess the partial INSV isolate host range. Inoculated plants were maintained in growth chambers at 25 °C with 16 h photoperiod for symptom development. All inoculated plants were tested by ELISA for INSV. This isolate was transmitted from Emilia sonchifolia to E. sonchifolia by Frankliniella occidentalis (Western flower thrips, WFT) to verify its vector transmissibility. Thrips transmission experiments (, with modifications) were conducted with symptomatic leaves from infected E. sonchifolia as virus source. First-instar larvae (12 h old) of WFT were given a 24 h acquisition access period and then reared on virus-free green bean pods until adulthood. These adult thrips were given a 48-h inoculation access period to 2 weeks old E. sonchifolia seedlings (20 thrips per plant). This experiment was repeated twice. Inoculated plants were maintained in a growth chamber (25 °C, 16 h photoperiod) for symptom development and then were tested by ELISA. Transient agroinfiltration was used to test the functionality of the INSV NSs protein as silencing suppressor according to previous protocols [12, 38]. Briefly, full-length UP01 NSs was cloned into pBin61 vector and transiently expressed through agroinfiltration together with pBin-GFP in 16C N. benthamiana. Vector only (pBin61) and pBin61-p19, both together with pBin-GFP, were used as negative control and positive control, respectively. GFP expression of agroinfiltrated plants was checked with UV light 3 days post-agroinfiltration. Total RNA was extracted from systemically infected N. benthamiana leaves using the Spectrum™ Plant-Total RNA Kit (Sigma-Aldrich, St. Louis, MO, USA), following the manufacturer’s directions. Reverse transcription was performed using Superscript IV reverse transcriptase (Invitrogen, Grand Island, NY, USA), random primers and 500–1000 ng of RNA as template. Overlapping amplicons were obtained by PCRs with gene-specific primers designed on conserved regions of available INSV isolates (Additional file 1) and the Q5 High Fidelity PCR Kit (NEB, Ipswich, MA, USA), followed by 5 min adenylation at 72 °C using GoTaq DNA Polymerase (Promega, Madison, WI, USA). PCR products were cloned into pGEM-T Easy vector (Promega, Madison, WI, USA) and sequenced at the PSU Genomic Core Facility by Sanger sequencing. Overlapping sequences were assembled using Vector NTI software (Invitrogen, Grand Island, NY, USA). Phylogenetic trees were constructed by neighbor-joining method  using MEGA7 software , with 1000 bootstrap replicates. Percentages of pairwise identity among the aligned nucleotide and protein sequences were calculated using MatGAT v.2.03 . Putative reassortment and recombination events were predicted by Recombination Detection Program (RDP4 v.4.80)  using several algorithms on the MUSCLE alignment file of concatenated full-length genome sequences, created with MEGA7. INSV-UP01 produced typical INSV symptoms of chlorotic blotches and mottling on local leaves of N. benthamiana at 4–5 days post-inoculation and curling of newly emerged leaves; and chlorotic spots, mosaic and mottling on the systemic leaves of E. sonchifolia. On both hosts the isolate produced occasional ringspots on the systemic leaves. The isolate was successfully transmitted by F. occidentalis. N. benthamiana, N. tabacum, impatiens, pepper, Datura stramonium and E. sonchifolia, could be infected with UP01, but not Arabidopsis thaliana. The three genomic INSV RNA segments were 8776, 4975 and 3010 nt in length, respectively (Additional files 2, 3, 4, NCBI accession numbers MH171172–MH171174). The L segment was predicted to contain an ORF of 8598 nt in position 8747-150 and to encode a putative RdRp protein of 2865 aa, in the negative sense. The M segment encoded the putative NSm protein in the viral sense in position 86-997 and the putative Gn/Gc protein precursor in the complementary sense in position 4805-1473, separated by an intergenic region of 475 nt. The M segment had 85 and 170 nt in its 5′ and 3′ UTR, respectively. The S segment encoded a putative N protein in position 2861-2073, and a putative NSs protein in position 80-1429, with an intergenic AU-rich region of 643 nt. Multifunctional properties of the NSs protein have been shown for orthotospoviruses . Since the NSs of TSWV has been demonstrated to function as silencing suppressor [12, 43–45], we performed in planta transient Agrobacterium tumefaciens silencing suppression assays  to test this activity for UP01 and demonstrated that UP01 NSs is a strong silencing suppressor (Additional file 5). Several amino acid substitutions distributed along the whole RdRp protein sequence were observed between UP01 and other INSV isolates (Additional file 6). UP01′s RdRp shared 97.6 and 97.2% nt identity, and 98.8 and 98.4% aa identity with NL-07 (X93216.1) and DQ425094.1, respectively (Additional file 7), and showed motifs conserved in the RdRp of this genus: motif A (DXXKW), motif B (QGXXXXXSS), motif C (SSD), motif E (EXXS) , motif F2 (KXQRTK) and motif F3 (DREIY) . Motif F1 (TDF), [48, 49] absent in all sequenced INSVs, was also not present in UP01. UP01 NSm predicted protein sequence had the ‘D-motif’ , which is a conserved region in the majority of viral movement proteins belonging to the ‘30K superfamily’ and ‘the P/D-L-X motif’ , ‘DSRK motif’ and ‘HH motif’, which play essential roles in the subcellular distribution and tubule formation of TSWV NSm protein . Analysis of putative reassortment/recombination events using INSV concatenated full-length genome sequences predicted the occurrence of a recombination event involving isolates UP01, NL-07 and the Italian isolate (Additional file 8). The event involved the L segment and was predicted by different algorithms with significance level set at P ≤ 0.05. UP01 is consistently placed into the same Western Hemisphere clade with other US isolates and NL-07, and is more distantly related to isolates in the Asian clade, where the Italian isolate also belongs (Figs. 1, 2, 3). As indicated by Elliott et al. and Nekoduka et al. , our result confirms that INSV isolates do not group phylogenetically based on host species (Figs. 1, 2; Additional file 9). UP01 RdRp ORF is overall more related to NL-07 than to other isolates (Additional file 8) but it shares different degrees of similarities with all isolates based on the region of the RdRp examined, suggesting a possible recombination event for this segment involving the region of 2850-8690. The resolution of the RdRp phylogeny is penalized by having only 5 sequences available. Phylogenetic analyses of the M segment and its two ORFs (Gn/Gc and NSm) (Fig. 1a–c) and IGR (Fig. 1d) show again that INSV isolates are divided into Western Hemisphere and Asian clades, with UP01 in the Western Hemisphere clade, and the isolates from Italy and Asia in the Asian clade. In the Asian clade are unexpectedly grouped also one A. thaliana (NSm JX138532.1, Gn/Gc JX138530.1) (Fig. 1a, b) and one lettuce isolates (KF745141.1) (Fig. 1b) from the US, suggesting that these isolates might be of European/Asian origin and have been introduced recently in the US. While this segment is better represented, still not many sequences are available to resolve some of the phylogenetic relationships for members of the two clades. Phylogenetic analyses using N protein nucleotide sequences (Fig. 2a) indicate that UP01 grouped in the Western Hemisphere clade. 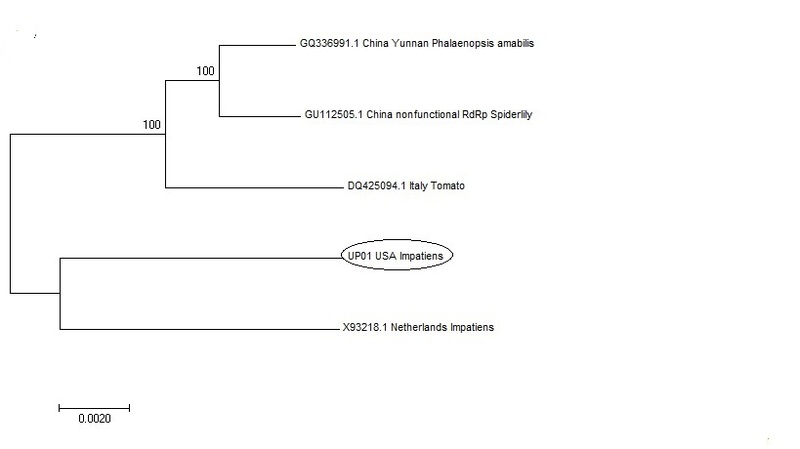 This clade contains isolates from the US and the Netherlands, but also one isolate from Japan (AB894565.1), again indicating that INSV was probably introduced into different regions via import of infected plant material. UP01N protein shares very high aa identity with other INSV isolates (Additional file 10). The division into Western Hemisphere and Asian clade is also congruent when looking at the phylogenetic analyses of the S segment (Fig. 2c), where UP01 belongs to the Western Hemisphere clade and is distantly related to the Chinese isolate (GU112504.1). But while for the M segment UP01 is closely related to the reference sequence (M74904.1, NC_003616.1), with whom it shares a more recent origin (bootstrap value > 90%), and it is less related with USA WA Basil isolate (KX790322.1) (bootstrap value > 90%) (Fig. 1c), the phylogenetic study of the S segment (Fig. 2c) revealed that UP01 is more related to the USA WA basil isolate than to the reference sequence. This observation, for the first time, questions combining in a reference genome sequences that superficially seem to belong to the same isolate, but that could belong to distinct clades, when analyzed using a larger number of sequences. An alternative explanation to our result could indicate a reassortment event between isolates from in different geographic regions that led to the emergence of the reference genome. Interestingly, the USA CA lettuce isolate SV-L1 (NSs KF745142.1 and N KF745140.1, respectively) that was isolated from an INSV outbreak in Coastal California clustered with other US isolates when its NSs (Fig. 2b) and N ORFs (Fig. 2a) were analyzed, but its NSm (KF745141.1) sequence grouped with the Asian clade with high bootstrap support (Fig. 1b), indicating a possible reassortment or recombination event. Unfortunately, the Gn/Gc sequences for these isolates are not available to support these hypotheses. The phylogenetic analysis of the N protein (Fig. 2a) is the one for which more sequences are available, and highlights how having a large number of sequences can resolve better the INSV phylogeny and can be epidemiologically informative. In fact, in the case of the INSV sequences reported in a recent outbreak in lettuce in Costal California , phylogeny shows that all lettuce strains responsible for the outbreak were identical or highly related, but they differed from isolates found in the surrounding weeds and crops. Result of the analysis of putative reassortment/recombination suggests that a recombination event involving UP01 might have happened. As mentioned above, phylogenetic analysis also supports the predicted recombination event (Fig. 3) and further confirms the occurrence of genetic exchanges in the evolution of orthotospoviruses. Reassortment is also biologically important because it could result in new resistant-breaking strains [45, 53, 54] or emergence of new viruses . Additional complete genome sequences from the INSV outbreak in Coastal California would be needed to confirm reassortment and recombination events between INSV isolates. KZ contributed to the design of the study, cloning and sequencing of the new INSV isolate, data analysis and preparing the manuscript. PM and CR contributed to design of the study, data analysis and preparing the manuscript. All authors read and approval the final manuscript. We sincerely thank to Dr. Gary W. Moorman (Pennsylvania State University) for providing us the infected plant tissue. Sequence data will be available from the additional files and other data will be available from the corresponding author upon request. C. Rosa’s salary is in part supported by USDA HATCH Accession Number: 1009992. Project Number: PEN04604. 13104_2018_3395_MOESM1_ESM.docx Additional file 1. List of primers. The table contains the list of primers used for RT-PCR and Sanger sequencing of isolate UP01, and includes the segment name, sequence from 5′ to 3′, and name for each of the primers listed. 13104_2018_3395_MOESM2_ESM.fasta Additional file 2. Sequence of INSV UP01 L segment in fasta format. 13104_2018_3395_MOESM3_ESM.fasta Additional file 3. Sequence of INSV UP01 M segment in fasta format. 13104_2018_3395_MOESM4_ESM.fasta Additional file 4. Sequence of INSV UP01 S segment in fasta format. 13104_2018_3395_MOESM5_ESM.jpg Additional file 5. Bioassays for silencing suppression activity of UP01 NSs allelic variant. Full-length UP01 NSs was cloned into pBin61 vector and transiently expressed through agroinfiltration together with pBin-GFP in 16C transgenic Nicotiana benthamiana. Vector only (pBin61) andpBin61-p19 were used as negative control and positive control, respectively. Pictures were taken by using a hand-held UV light 3 days post-agroinfiltration. 13104_2018_3395_MOESM6_ESM.jpg Additional file 6. 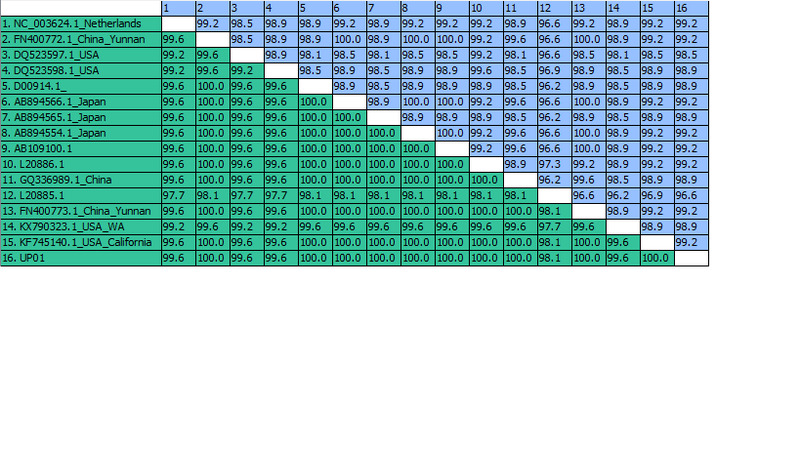 Alignment of INSV RdRp amino acid sequences. 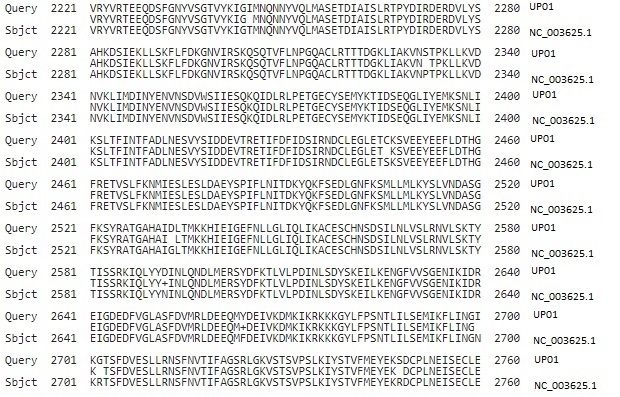 Figure shows the amino acid substitutions distributed along the 2221–2760 amino acids of the Query: UP01 and Sbjct: NC_003625.1 RdRp protein sequences. 13104_2018_3395_MOESM7_ESM.jpg Additional file 7. (a) pairwise comparison of RdRp predicted amino acid sequences and (b) pairwise comparison of RdRp nucleotide sequences. The table contains the RdRp nt pairwise comparison among INSV isolates listed in the first column. Values in blue cells indicate percentage identity. INSV isolates are identified by their accession numbers in NCBI. 13104_2018_3395_MOESM8_ESM.docx Additional file 8. Putative recombination event among full-length INSV isolates of different geographic origin, predicted by the RDP software. Analysis of putative reassortment/recombination events using INSV concatenated full-length genome sequences predicted a possible recombination event involving isolates UP01, NL-07 (from the Netherlands) and the Italian isolate. The event involved the L segment and was predicted by different algorithms, with significance level set at P ≤ 0.05. 13104_2018_3395_MOESM9_ESM.jpg Additional file 9. Neighbor-joining phylogenetic tree derived from the alignment of INSV RdRp coding sequence (cds) of different INSV isolates. Bootstrap values were derived from 1000 bootstrap replicates. Accession numbers and plant host species of the sequences are shown in the figure. 13104_2018_3395_MOESM10_ESM.jpg Additional file 10. Pairwise comparison of N protein predicted amino acid sequences. 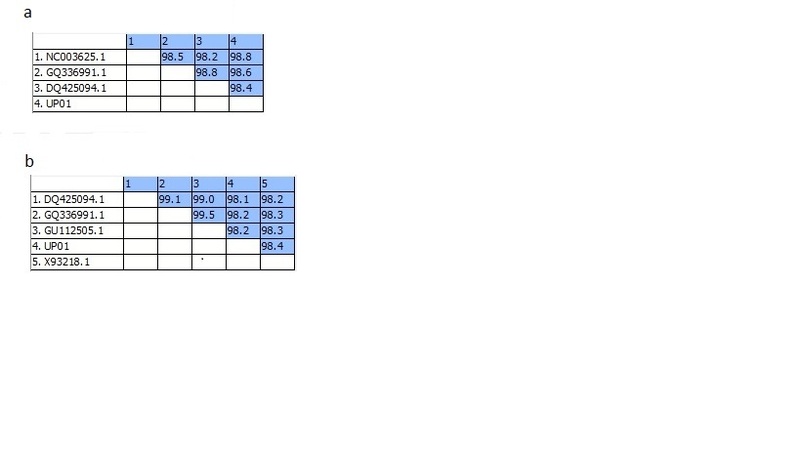 Table contains the N protein amino acid pairwise comparison among INSV isolates listed in the first column. Values in blue cells indicate percentage identity. Values in green cells indicate percentage similarity. INSV isolates are identified by their accession numbers in NCBI.